Long an integral part of the Canadian freshwater angler's arsenal, float (bobber) fishing for salmon and steelhead is a relatively new addition to the tactics used by American anglers. Each year, more and more anglers are utilizing floats on American streams as the knowledge of their versatility, effectiveness, and ease of use becomes broader in the angling circles. Basically similar to the bobber and worm rig that so many of use used for trout or panfish as youngsters, the rigging of floats and the associated terminal lure / bait of choice is done in a variety of ways. While many anglers utilize a fixed bobber, we usually prefer to use a slip bobber setup as the finished slip bobber rig is usually easier to cast than the fixed bobber setup. 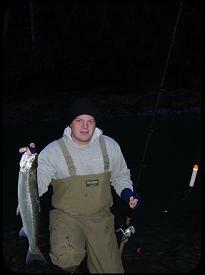 Bobber fishing accounted for over 30 hook-ups on this day of winter steelhead fishing. Under the bobber, a variety of lures / bait can be used to entice strikes from either salmon or steelhead: jigs, plastic worms, and eggs or sandshrimp are the most often used in our boats. Below, you will find a description of how to rig the slip bobber and a brief introduction to each of the terminal lures / bait that we choose to use in our pursuit of these anadromous salmonids. The diagram at right outlines the basic rigging of the slip bobber. Usually for most of our bobber fishing for steelhead, 12 lb. test is sufficient for mainline strength. Your first step is to set up your bobber stop. Stops are available in a variety of styles: from plastic strips through which you weave your line; rubber bands tied on the mainline; to nail knots on a plastic tube; the latter of these we prefer to use due to ease of going through the guides and tendency to stay in place during use. We prefer to use some of the newer superlines, especially a line called Powerpro for float fishing as it floats on top of the water w/o dressing and also has zero stretch for maximum hooksetting power in this type of fishing. Below the bobber stop, you'll need to place a very small bead on the mainline. The inner bead hole must be small enough to not slip over the bobber stop on your line, nor must the outer diameter of the bead allow it to insert into the hole of the bobber. These beads usually come packaged with the bobber stops, but are available by themselves, it is best to keep a bunch on hand as they are easily dropped and lost while rigging. An example of a common way to rig a slip bobber for float fishing. Your next step is to slide the bobber up the mainline. 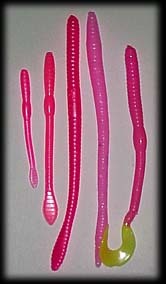 Bobbers are available in a variety of styles: foam dinks, and elongated balsa being the most popular. We usually use the foam dinks as they don't suffer any damage when accidentally landing on a rock on a misguided cast. Below, you bobber simply tie on a size 7 barrel swivel. Below the barrel swivel, you can tie on a wide selection of terminal rigs, and add weight according to what you are using. Perhaps the most versatile of the terminal rigging, we have had lots of success with these for steelhead and have also had some good luck fishing for salmon under very low water conditions with them. Typically, the jig is tied on with about 18-24 inches of leader below the swivel, with a couple of size 3 split shot attached near the swivel. The 1/4 ounce jigs are our favorite ... there are many different sizes available ... the heavier ones (3/8 to 1/2 ounce) are popular under higher water flows, but typically, under higher water flows, we will be fishing something other than this rig. Color preference variances are quite common amongst different anglers. 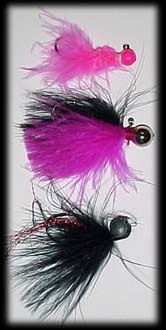 For steelhead, our favorites are all pink, pink / white, and cerise / black combinations. For low-water salmon, black seems to be the best choice. Key in your presentation is keeping the drift of the bobber as close as possible to current speed and adjusting your length of line under the bobber to keep the jig within 12-18 inches of bottom. Perhaps the single most popular terminal offering in Canadian waters, the worm is seeing an explosive growth in popularity in other areas. We utilize the worm in water conditions closer to normal or above normal flows as compared to our use of the jig. The worms are really no different than the plastic bass worms that we have all seen at one time or another. Available in a variety of colors, the bubble-gum pink color seems to be most effective in most situations. The standard size of worm used is the 6 inch length. Although the 4 inch worms have proved to be very effective in lower conditions. The worms are threaded onto the leader with the hook remaining outside of the worm worm about an inch and a half up from the tail (see our tip on the worm for more detailed instructions on how to thread it). As with the jig, leader length is usually around 18-24 inches below the swivel. Generally speaking, a little more weight is attached below the bobber with the worm than with the jig. It seems to be best to disperse the split shot along a greater length of the leader to help keep it near the bottom. The salmon don't seem to be as receptive to this offering as the steelhead. Along the same lines, wild fish seem to be much more likely to strike this rig as compared to their hatchery counterparts ... no explanation of this, just an observation we've noticed on the Olympic Peninsula streams. The most tried and true method of float fishing in both Alaska and Washington, salmon anglers have been long using been using bait under a bobber, especially in the tidewater stretches of the rivers as well as some of the back eddies and other difficult to fish water found further upstream. 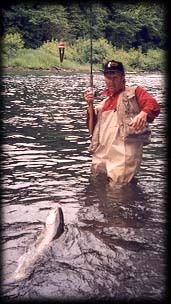 Bait under a bobber can be a deadly technique for extreme low water salmon in the fall. Eggs are generally most the most popular bait of choice, especially for salmon, although sandshrimp are used to a lesser extent. Sometimes a combination of the two is used ... referred to as a 'shrimp cocktail'. Bait sizes and hook combinations may range from a cluster of eggs no larger than your little fingernail on a size 4 hook to a glob the size of a golf ball or larger on hook sizes of 3/0 or 4/0. The size depends upon your targeted species and the prevailing water conditions. Under low water conditions, straight bait is usually most popular. When the water has a little more color in it, however, you might consider adding a tuft of colored yarn to your offering. Generally speaking, the leaders for fishing bait are a little longer than for worms or jigs. In addition, the added weight is usually kept a little higher above the bait. Above: a variety of jigs that are usually fished under a bobber. Above: Some of dozens, if not hundreds of pink (or similar color) worms on the market today. Eggs under a bobber worked along a 'dead water seam' fooled this winter-run steelhead. As previously mentioned, bobbers are extremely versatile. You can fish them in water from fast moving riffles to nearly still pools or eddies. Float fishing is most productive when offered as a 'dead drifted' presentation ... that is, floating at current speed with little or no swing. This is easiest from a boat moving with the current, but can also be achieved by bank anglers. Keep your offering near the bottom ... that's where the fish are! Watch the action of the bobber to see how close you are to the bottom if you are unsure of the depth. You should see the top of the float tip downstream every so often ... this the the offering tapping a rock on the bottom. If you never see the bobber do this, it means that you likely are not near the bottom. Gradually increase your depth until you see your bobber doing this. Keep your drift as natural as possible ... this can be achieved by keeping as much line between the rod tip and bobber out of the water, and if some of it does enter the water 'mending' it upstream to prevent the belly of line that forms in the water from pulling the bobber downstream faster than the current flow. The diagram below shows what would be considered 'prime' float fishing water and how you might fish it. Fishing for steelhead from the boat, we generally spend most of our day drifting a long stretch or water, covering all those areas that would possibly hold fish. For bank-bound anglers, concentrate on the current edges that you can work slowly ... trying to drift an entire hole without lifting the offering off the bottom as it swings across the current below you can be difficult ... this can be done with some success by those bank-bound anglers equipped to free-spool line (levelwinds vs. spinning) and able to keep a belly of line forming between the bobber and rod tip (the primary reason many people use long rods for float fishing). One thing that really differentiates float fishing from fishing hardware or drift gear is the ease in distinguishing what is a bite and what isn't. While every dive of the bobber isn't a bite ... if the bobber's depth is properly set, the visual clue of the bobber going under the surface usually signifies an interested party at the other end. This visual clue is especially helpful for those who haven't had a lot of steelhead or salmon fishing experience and have difficulty in detecting some of the more subtle bites. Like any other form of fishing for steelhead or salmon, if you're unsure, set the hook! When fishing jigs, tip the jig with a small chunk of prawn (uncooked) ... it looks funny, but it is deadly! As with most forms of drift fishing, use a lighter leader than mainline, that way if you snag up your terminal offering, you are likely to at least get back the remainder of your setup above the swivel. Use as long as a rod as you are comfortable with ... the longer the rod, the easier it is to keep line up and off the water, reducing downstream drag. Resist the temptation to free spool too far downstream! Although it is fun to watch your bobber go under a hundred yards downstream ... you'll find it very tough to set the hook with lots of line out. Also making hooksets difficult are rods that are too limber. Keep this in mind when selecting a rod for float fishing.